Dragon Blood Jasper is a member of the quartz family, chalcedony. It is a patterned gemstone with deep red tones of matrix joined with a combination of forest green . It is found only in western Australia. It is good for nerves, bladder, spleen, stomach, kidneys, liver, bile ducts, mineral balance and sense of smell. 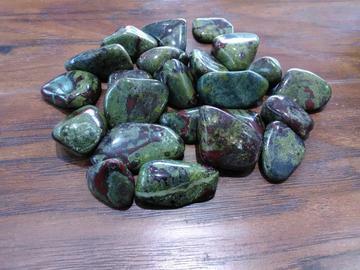 The healing qualities for this stone enhances life force, courage, strength and vitality. Physical: Good for nerves, bladder, spleen, stomach, kidneys, liver, bile ducts, mineral balance and sense of smell.